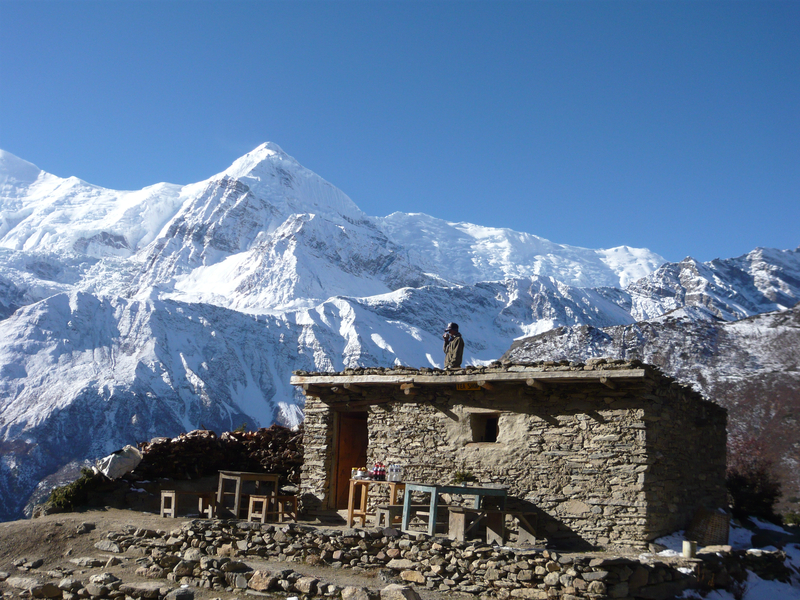 Photo taken along the Annapurna Trail, November 2010. For more blog posts on my trip to Nepal, please visit thirdeyemom. While hiking the Annapurna Trail on about day 10 and nearing the highest point of the trek, we stopped for a mint tea at a small, remote teahouse perched at the top of the world. Here I snapped this photo of the mighty, majestic Himalayas only to discover there was a man standing on top of the roof of the teahouse in the photo! I thought it was ruined and was able to delete it but then changed my mind. For the size of the man offered the true scope of how incredibly large the Himalayas are. It is now one of my favorite pictures from the trip. I also believe that there are indeed two subject in this photo: The man and the mountains. I love this photo Nicole for the contrast between stone and snow! The lone figure adds a sense of scale and a feeling of isolation and solitude. Great pic! Thanks Lucy! I think Nepal is my favorite place. I keep thinking about it and never forgetting it. I love mountains and it was so surreal there. You have to go someday! I still want to do the trek to Everest Base Camp someday! 🙂 Not of course the peak! I’m not that ambitious or crazy. Base Camp is doable as it is same height as I got to in Annapurna. I hope I make it some day! Would love to do a trek there! I also love seeing the Lecacy of Coca Cola way out there! !